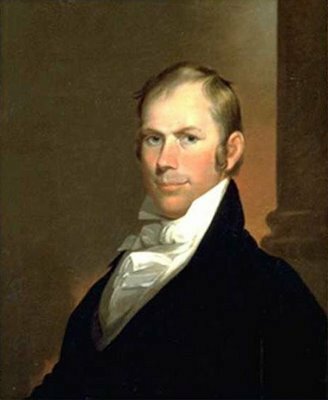 Today is the birthday of Henry Clay Sr., a great lawyer and orator who represented Kentucky in both the U.S. Senate and the U.S. House of Representatives, where he served three different terms as Speaker of the House. He was also Secretary of State from 1825 to 1829 under President John Quincy Adams. Clay, known as “The Great Compromiser,” was instrumental in both the Missouri Compromise of 1820 and the Compromise of 1850. But there was one matter on which he apparently did not compromise: his bourbon. Legend has it that Clay also introduced the mint julep to Washington, D.C., during his time as a U.S. Senator, but we will try not to hold that against him. Born in 1777, Clay died in 1852 and was the first person to lie in state in the U.S. Capitol. You can visit his estate in Lexington, where it is maintained as a museum. See details here.